Four miles from Dunvegan on the single track road to Glendale is the scattered township of Colbost, looking east over Loch Dunvegan. This part of the Duirinish peninsula is best known for the presence of The Three Chimneys, a restaurant with a worldwide reputation. 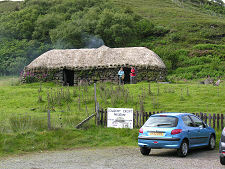 Immediately to the south of The Three Chimneys, on a gentle hillside rising up past the road from the shore of the loch, is the Colbost Croft Museum. 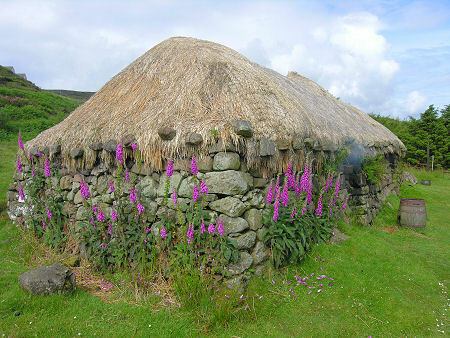 Established in 1969 by local man Peter MacAskill (who has since also established the Giant Angus MacAskill Museum in Dunvegan), it was intended to give visitors the chance to experience a way of life that was very common on Skye in the 1800s. 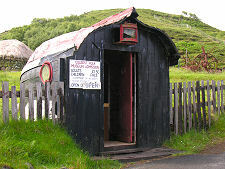 It is one of a trio of fascinating museums to be found in the unlikely setting of the northern part of Skye's Duirinish peninsula. 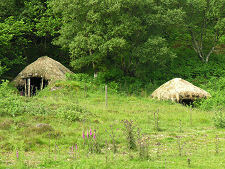 The others are Borreraig Park Museum and the Glendale Toy Museum. Together they form a triangle that gives good reason to head west from Dunvegan, even on a driech day. 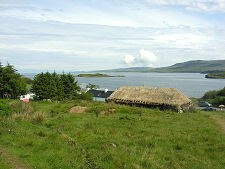 The focus of the museum is the croft house, of a type reminiscent of a Western Isles blackhouse. 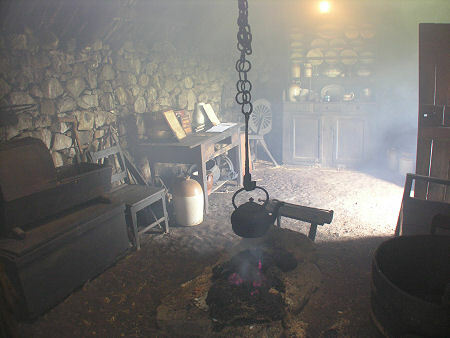 The smoke rising from the central chimney, and possibly curling out from the doorway, gives a clue about one of the defining characteristics of life in this sort of house: the open hearth in the centre of the floor, on which a peat fire was kept burning continuously. To modern sensibilities, it is difficult to see how people could have lived continually in an atmosphere made dense by peat-smoke. 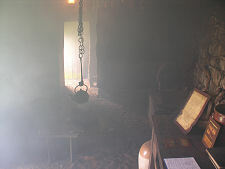 But on the bright side, the smoky atmosphere was said to help keep vermin and other pests at bay. Once experienced, the phrase "peat-reek" takes on a very distinctive meaning that you are unlikely to forget. 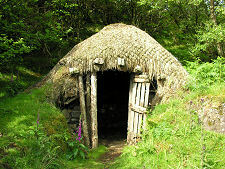 The croft house has two main rooms, a kitchen and living room, and a bedroom. The bare earth floor and unadorned dry stone walls leave you in no doubt that this would have been a very basic place to live. 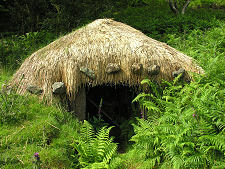 Yet you also get the sense that, even in this fairly exposed location, this house would have kept its occupants snug though the worst that a Skye winter could throw at them. Another clue to how the long dark nights of winter might have been passed comes from visiting the two thatched outhouses behind the croft and a little way up the hill from it. One of these was intended primarily for storage. 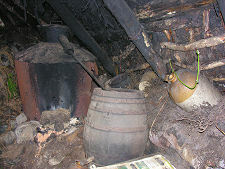 But the other is shown as the home to a replica of an illicit still. There was a time when stills like this one were very common across the length and breadth of the highlands and islands of Scotland, foreshadowing an industry that many regard as one of Scotland's two great gifts to the world. 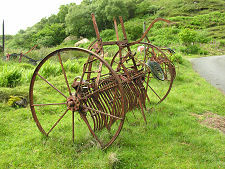 Scattered around the pasture surrounding the croft house are a number of agricultural implements, though identification of precisely what their individual roles were is sometimes not a straightforward task for modern visitors.